DRYSTAR AXYS offers a new "axis" for digital radiography workflows, including for mammography imaging. With its small footprint and two-on-line media trays that can handle a variety of media in many different sizes, it will fit into any type of facility, supporting a broad range of applications. As all DRYSTAR imagers, the DRYSTAR AXYS comes with Agfa HealthCare`s Direct Digital Imaging technology enhanced with A#Sharp™ for consistent and sharper image quality across all applications. Enjoy the benefits of increased productivity thanks to the ultra-short access time and the efficient throughput; the first prints are available in an instant. Despite its compact size, DRYSTAR AXYS offers a great range of possibilities. It can be used in both centralized and dedicated workflows. It fits a full range of applications. And it features daylight handling for the two on-line media sizes, with five media sizes and three different media types available. The imager thus offers enhanced flexibility and convenience. Its ultra-short access time for the first four prints, as well as its efficient throughput, provide improved workflow and increased productivity for almost all radiology applications. As with all of Agfa's DRYSTAR family of imagers, DRYSTAR AXYS features Direct Digital Imaging (DDI). This solid-state technology avoids the use of complex optical components, for an imager that is more reliable and durable by design. In addition, DRYSTAR AXYS is ecological and user-friendly, requiring no wet processing, darkroom, complicated adjustments or cleaning procedures. With DRYSTAR AXYS, the mammography department can enjoy all the convenience of a table-top, digital imager. Its high resolution of 508 dpi matches the 50 μm modality resolution, without interpolation. The result is the superior image quality required for diagnostic mammography images. Yet the DRYSTAR AXYS offers the same reliability, affordability and convenient size of all the Agfa DRYSTAR table-top imagers. DRYSTAR AXYS is the right solution for both smaller facilities with limited space and lower patient volume, and larger facilities with many departments. As a centralized imager, it supports a wide range of applications, including CT, MR, DSA and US, as well as CR/DR applications for GenRad, Mammography, Orthopaedics, Dentistry, etc.Equally, its compact design makes it the ideal dedicated departmental imager, for the digital mammography department, for example. 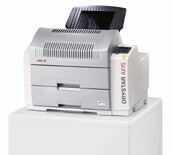 DRYSTAR AXYS is a DICOM-native imager, which makes network connectivity easy. For point-to-point connection with non-DICOM modalities, DRYSTAR AXYS can be used with Agfa's LINX™ Paxport™. Includes Agfa's DICOM 3.0 PMS Package with up to 6 DICOM connections at not charge if connected at time of installation.